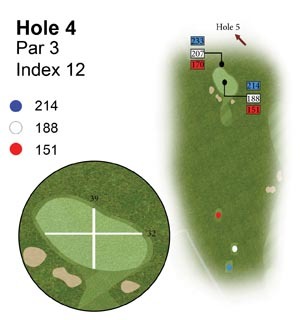 This Par 4 has trees down the left side of the fairway and Out of Bounds down the right. A 200 yard tee shot will leave you a clear view of the green. 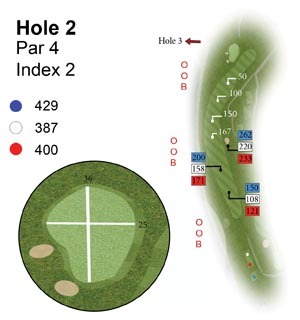 A long iron or rescue club with the prevailing wind would be a better option for your first shot of the day. From 150 yards you will have a bunker left and right of the green with out of bounds over the back. The first green has a gentle slope from front to back with a slight tier in the middle of the green. This is a long hole with a slight dog leg to the right. 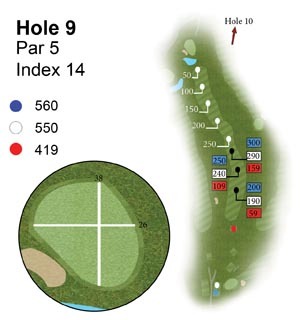 This par 4 index 2 requires a drive left of the bunker, with out of bounds left from the tee to the green with a large grove of trees on the right. This is a demanding tee shot.The 2nd green slopes from back to front with a few different tiers, anything above the hole will leave you a treacherous putt down the slope. An uphill short par 4 with 3 fairway bunkers 2 on the right and one on the left. A 230 yard shot will carry the bunkers on the right, but the one on the left is about 245 yards to carry. The 3rd green is slightly bowl shaped with a slope from front to back. 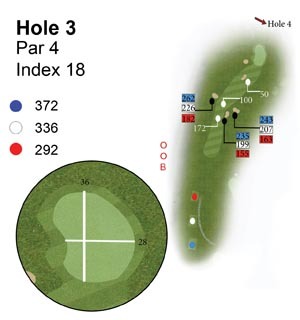 A testing par 3 playing all of its length, pot bunkers protect this green on the front and severe slopes off the back and right. Downwind it is hard to stop a ball on this green, so short is a good option. 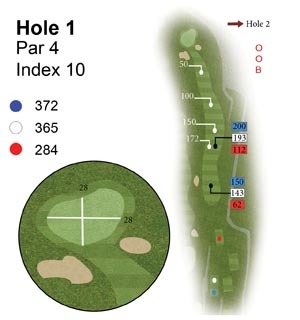 A green that slopes, from back to front and has lots of little borrows, a par is always a good score on this hole. 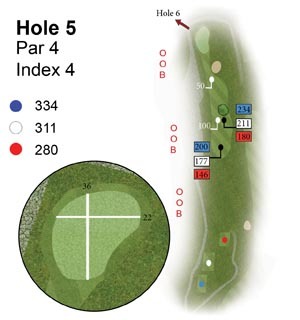 The par 4, 5th has a very narrow fairway with out of bounds left. A large tree in the middle of the fairway and a ditch and trees on the right. A long iron 180 yards will leave you far enough back to go over the tree, a driver needs to go past the tree and must be straight. The green slopes severely from back to front, a very slow putt up hill when the pin is at the back. A straight forward looking par 4 looking back towards the clubhouse. A generous fairway with room on the left but the fairway slopes from left to right. A large spinney of trees awaits a wayward drive. The green slopes from back to front and left to right. 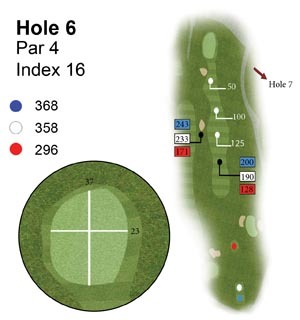 A good driving hole with out of bounds left in the clubhouse car park and out of bounds right on the road. A narrow fairway awaiting your drive this par 4 has lots of trees left and right. The green slopes from right to left with a slight tier on the left side. The tee shot on this par 5 needs to be hit down the tree lined right hand side. This line will leave you right of centre on the fairway and will help with your second shot which must be hit towards the right hand bunkers leaving 100 yards to the green. 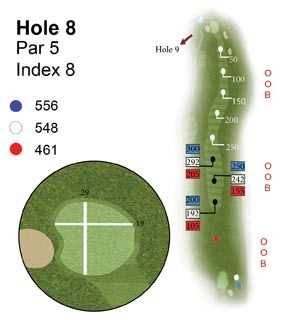 The 8th green is very receptive and slopes from right to left. 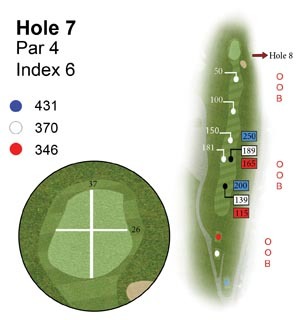 A true par 5 only reachable in two by the longest of hitters. A very generous fairway doglegs from right to left.Don’t cut the corner as the grove of trees on the left has trapped may a hooked drive. A large pond protects the front of this long green with a tier in the middle and it slopes from back to front.